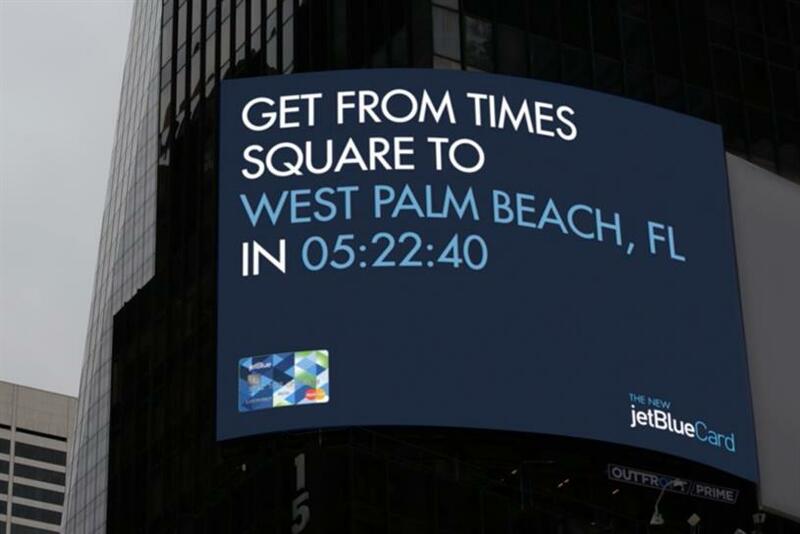 To introduce the new JetBlue credit card, MullenLowe and OutFront Media have erected a billboard in New York’s Times Square that tells passersby how long it would take them to get to various vacation destinations from where they’re standing — and then gives them a chance to go for free. "We thought, maybe there’s something fun in the idea of the card earns you points so quickly it gets you to places faster than you expected," said Jon Ruby, senior vice president and creative director at MullenLowe. "OutFront came to us with the opportunity to have a billboard that used live information. So we came up with this concept of looking up at the billboard from wherever you were standing and knowing how fast you could get to any JetBlue destination." Using real-time traffic data from the Google Maps API, the billboard displays current driving times to various airports. And using JetBlue’s active flight schedule, it displays departure and flight times to destinations such as West Palm Beach, Los Angeles and Las Vegas. By combining the data, it tells onlookers precisely how long it would take them to reach a vacation spot, provided they leave immediately. To help make that happen, the billboard gives away free round-trip tickets three times a day (at 8:30 a.m., 12:00 p.m. and 6:00 p.m.). "The first to tweet #2XASweepstakes @Jetblue gets a roundtrip ticket," reads the billboard, according to the case study video. The promotion is the centerpiece of a campaign to launch the JetBlue credit card, which gives users free points toward travel with every purchase. The theme of the campaign, fleshed out in an accompanying ad campaign, is that the card gets you on vacation faster. "It’s a pretty unique product in the travel credit card market," Ruby said. "It earns you points at a really accelerated rate." Four commercials feature people who use the JetBlue card to arrive at their dream destination so quickly, they are unprepared when they get there. One woman dreams of going to Aruba on her honeymoon, but arrives before she has a chance to get married and ends up dancing, pedal-boating and playing volleyball by herself. Another spot features a man named Brian who dreams of going to San Francisco to pitch a startup idea, but arrives before he has one, and ends up awkwardly pitching a non-company called "Brian Company." The commercials, which have been on the air for several weeks, are running in key JetBlue markets such as New York, Boston and Fort Lauderdale. They are also appearing in pre-roll form on YouTube clips.